The Southeast Museum of Photography offers a variety of programs and educational courses for people of all ages, year round. Age limits and group sizes vary by program. For more information or to register for any of our programs contact us. DIGITAL PHOTO ACADEMY - COMING THIS SUMMER 2019! 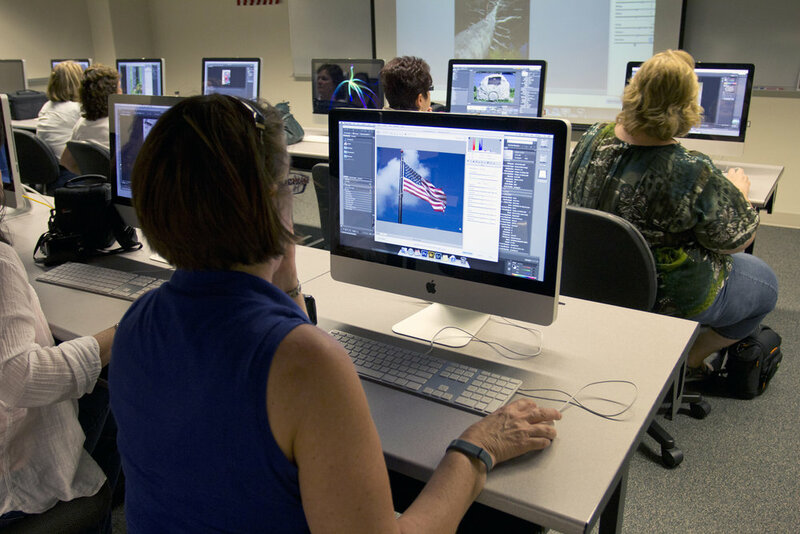 This two-week, intensive digital photography program places an emphasis upon learning fundamental skills, enhancing perceptual abilities and building a beginner's portfolio. Students are introduced to a wide range of photographic styles. Participants complete the program with a portfolio, and their best images are included in an exhibition in the museum's Youth Gallery Space. Geared for ages 14-17 years. Click here for more details and scholarship opportunities. Registration forms for our 2019 session will be available in soon! Click here to view highlights and gallery images! The Southeast Museum of Photography offers a number of seminars and workshops designed for adults of all ages and skill levels. These workshops are for individuals who wish to learn more about photography, but may not necessarily wish to pursue it as a career. Workshops can include topics such as the preservation of family photographs, archiving and cataloging, basic digital camera operations and composition techniques, and even intermediate to advanced lighting and editing techniques.Due to limited space, advance registration and payment is required. Veterans are provided with free art materials, and classes are structured so that with each new concept or medium to explore, participants can create and finish a complete work of art. These small-group sessions allow veterans to meet and learn from professional artists, to discover and cultivate their own talents, and to transform their experiences through the thoughtful and therapeutic form of self-expression. * Check online or call for updated session dates. Participants meet at the Southeast Museum of Photography, located at 1200 W. International Speedway Blvd, Daytona Beach, FL 32114. These classes are open to all veterans in the county, but registration is limited. Due to limited space, pre-registration is required at least 24 hours in advance. This program gives teens an opportunity to photograph as a group while receiving feedback and advice on camera exposure and composition techniques. There is no charge for this program, but participants are expected to bring their own cameras and arrange for their own transportation. Spaces are limited, so registration is required in advance along with a completed off-campus field trip form. Roland Miller has been photographically documenting and interpreting the United States’ space program for over 25 years. His series of images, Abandoned in Place, records the remains of the early space launch and research facilities around the country. Miller’s photography has been exhibited at the John F. Kennedy Space Center in Florida, and a selection of images from the Abandoned in Placeseries was on display in the Astronaut Crew Quarters at the Kennedy Space Center from 1998 to 2000. Selected works from Abandoned in Place will be shown in an exhibition this summer at the Southeast Museum of Photography. Call (386) 506-4569 for more details or email Christina.Katsolis@DaytonaState.edu to register! This lecture series is designed to engage the community—especially young and emerging artists—by presenting a wide array of guest speakers and professional photographers to the public.